This was a 4-day backpacking and mountaineering expedition to North Palisade Peak, 14242 ft./4341m, and Starlight Peak, 14200 ft./4328m. Located directly above the largest glacier in the Sierra Nevada mountains, North Palisade is the highest peak in Kings Canyon National Park; it is officially the 4th (unofficially the 3rd according to latest measurements) highest peak in the state of California. Rated class 4 difficulty, North Palisade is also technically one of the most difficult among California's 14ers (mountains over 14,000 feet elevation). All this makes successfully reaching North Palisade a proud achievement of many a California mountaineer. On September 5th, 2009, Vladimir Ulyashin, Hakan Yalcin, and myself successfully summitted North Palisade. Barely one-tenth of a mile horizontal distance from North Palisade's summit, Starlight Peak is a sub-peak of North Palisade whose summit is a thin, exposed spire - the "Milk Bottle", rated 5.4 difficulty. Just 12 meters lower than North Palisade, it is the 5th highest peak in California. Like Thunderbolt Peak nearby which we climbed the previous year, Starlight Peak is an exhilarating challenge for any ambitious rock climber. On September 6th, the three of us successfully summitted Starlight Peak. All photo credits go to Hakan and Vladimir. Vladimir and myself explored the Dusy Basin and Palisade Basin areas on our way to climb Mount Sill in 2003 (see trip report). As we passed the foreboding southwest face of North Palisade Vladimir attempted unsuccessfully to climb North Palisade via a chute unknown to us at the time - Putterman Couloir. In 2008 the three of us (Vladimir, Hakan, and myself) plus Samantha Olson undertook a 4-day trip to the Palisades area to climb North Palisade. We ended up climbing Thunderbolt and Polemonium Peaks instead. Both are lower peaks with shorter climbing routes than North Palisade, but their difficulty ratings are higher. Although we ran out of time to climb North Palisade, during that successful trip we gained valuable route knowledge and confidence to better prepare ourselves for climbing high peaks in the Palisades (see Hakan's trip report slide show). Our experience with roped climbing in a 4-person party on key portions of the routes helped us this time with gear preparation and logistical planning. Being the best climber in our team, Vladimir was to lead technical rock pitches. Armed with extensive route research, Hakan was to lead route-finding. Samantha and I have more technical climbing experience, we were to organize gear, set up belay and rappel, etc. Samantha was originally going to be on the trip, but she unfortunately had to cancel. North Palisade, Starlight, Polemonium, and Thunderbolt Peaks seen from the summit of Mount Sill. North Palisade and Starlight Peak seen from the summit of Polemonium Peak (2008). Starlight Peak seen from near the summit of Thunderbolt Peak (2008). 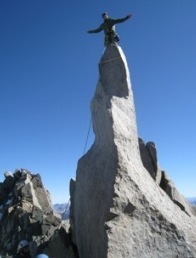 Samantha on top of the class 5.9 summit block of Thunderbolt Peak (2008). We planned the climbing trip on a Labor Day holiday weekend, which, with the addition of Friday September 4th, gave us four days. We were to leave the Bay Area for Bishop on Thursday evening. Due to my late work schedules I was able to start driving at around 10pm, first picking up Vladimir, then meeting Hakan around 11:10 pm. (Curiously, I originally planned to drive across the Bay Bridge after work, but due to a 4-day-long bridge closure scheduled to start just 2 hours before I was to drive across it, I had to change my plan to take the BART train across the Bay before getting in my car.) Three of us were excited to meet up again, especially Hakan whom I last saw many months ago. The long night drive was very quiet and calming, while we caught up on news of each other's busy lives. We had to take a detour on Hwy 108 since the shorter Hwy 120 route was closed due to wild fires, adding an extra hour to our normally five and a half hour drive to Bishop. Around 2:30 am we camped at Kennedy Meadows for the night, waking up around 7 am the next morning and continued driving. We arrived in Mammoth Lakes around 10 am, where we had breakfast, got wilderness permits, and I bought a pair of hiking poles since I forgot to take them. These poles proved essential later, one of which accompanied Vlad all the way up both North Palisade and Starlight Peak summits. By 12:30 pm we arrived at the South Lake trailhead (9800 ft.), a stunningly beautiful place. We chose the Bishop Pass trail off of South Lake trailhead since it provides access to the technically easier southwest chutes of the Palisade peaks, circumventing the Palisade Glacier. This way we would not have to carry the extra weight of ice axes and crampons. Since we're also carrying a full length climbing rope and a small rock climbing gear rack, minimizing the weight helps us hike a bit faster, and that may allow us to camp closer to our objectives. We planned to camp in Palisade Basin, the most convenient staging point close to the high peaks of the Palisade group. This would shorten the distances we have to cover on climbing days. However we also had concerns about water availability in Palisade Basin, because it's late in the season and most of the snow patches in the area would have melted completely. In order to camp near a water source we may have to lose a lot of elevation to go near the permanent lakes after crossing the 12400 feet high Thunderbolt Pass from Dusy Basin. We spent some time getting the backpacks and climbing gear ready. We ended up taking a small number of cams, quick draws, slings, and runners, not sufficient to climb the class 5.4 "Chimney Variation" (2 pitches) on North Palisade. Unlike the previous year when Samantha brought a full climbing rack to our Palisades trip, this time all three of us combined didn't own enough gear. Also because managing more than 2 climbers is very time-consuming on a multi-pitch trad climb, we decided to save time by opting for less technical routes to the peaks. We expected to do up to 4th class climbing for both peaks, and 5.4 climbing for the summit block of Starlight Peak, the "Milk Bottle". We would use the climbing gear to protect short, exposed sections of the climb, and to set up rappels. We started hiking as soon as we were ready, shortly before 1 pm. The weather was cloudy and windy, and for several miles of the hike it drizzled and even rained. I had to insert my sleeping bag into the bottom of my backpack, hoping that it won't get too wet too soon since I didn't bring any rain protection. All the backpackers heading out of the back country told us about windy and rainy weather, not exactly what we wanted to hear. Hikers we met were surprised to see us heading into the back country under such weather conditions, when everybody else were on the way out. After a few miles Vlad started to report sleepiness and altitude-induced headaches; he had very similar problems on the previous trip on the first day. Hakan and I hoped that he would regain his energy on the subsequent days, like he did before. After about 7 hours of hard hiking, we were still quite a ways before Palisade Basin, our planned camping spot. Thanks to our memory of the previous trip, we were able to navigate the difficult, trail-less terrain in Dusy Basin following a fairly efficient route, avoiding too many ups and downs. The sun was low on the horizon, Vlad lagged hundreds of feet behind Hakan and I in Dusy Basin, when I heard him reporting a twisted ankle. This made further progress dangerous for him; I thought we had to set up camp right away. I was concerned that he could be out of commission for the entire trip, having to rest in the tent the whole time; but worse, if he hurts his ankle more while trying to scramble in this unforgiving terrain it could leave him stranded at 12000 feet elevation and exposed to the elements. Vlad contemplated staying in the back country for a week healing his ankle while begging for food from passing hikers. Luckily we were in the vicinity of two tarns surrounded by meadows, a welcome respite from endless boulders and talus. I suggested setting up camp right here, at about 11700 feet elevation. Hakan was worried about the cleanliness of the stagnant water in the tarn, now that all the snow around it had melted and the water level was low. Since we had a water filter with us, this was an acceptable water source, and probably as good as it was going to get. We set up camp while night fell, the air became very cold, driving us all to retire into our tents. Vlad went to sleep immediately without eating anything, while Hakan and I quickly cooked and ate our meals. We decided that we would climb North Palisade the next day. North Pal was our bigger goal of the trip, and we already had good route knowledge of most of the route from the previous trip, therefore our confidence of reaching the summit was higher than Starlight Peak. Given that bad weather and Vlad's injury could derail some of our plans during the weekend, we wanted at least to bag North Pal. Drizzly weather at South Lake. Marmot on the Bishop Pass trail. Hiking in lush Bishop Creek basin. North Palisade/Starlight Peak group (center left), viewed from Dusy Basin. Filtering water from the stagnant tarn. The next morning we woke up around 6 am while the sky was already bright. Vlad was worried about not being able to keep up with Hakan and I. He decided to start earlier, without eating breakfast. He borrowed one of my trekking poles and set out toward Thunderbolt Pass, carrying a walkie-talkie with him. When Hakan and I set out about 40 minutes later, we realized that Vlad had taken a less efficient route. The two of us were able to progress quickly thanks to Hakan's navigation expertise: we followed a line of least resistance through a series of easy slabs and meadows before crossing the final section of huge boulders. Along the way a pair of agile climbers passed us on their way to do a Palisades traverse - a very challenging climb along the Sierra Crest linking five 14ers in the Palisades group. They told us they started out from the trailhead at 4 am and hiked all the way here. Compared to them our goals were much less ambitious, but they were obviously very good climbers. Hakan and I were worried about Vlad because we couldn't see him while surveying the route he would be climbing. Then he called on the walkie-talkie and asked us whether we could see him. We could now, and shocked to find out that he was on a very steep snow field high above the route we thought he was on. Since it's early fall the snow fields should be very icy and extremely treacherous. Vlad asked me which way to go, I pointed out the way for him to get to safer territory. It was very unnerving to see him trying to kick steps using his worn-out soft boots, without ice axe and crampons that would have been necessary. We were relieved to see him finally back on solid rock. The two of us gained the summit of Thunderbolt Pass shortly, meeting several parties of climbers, some camped here the previous night. Vlad caught up with us at the pass soon after. We scrambled toward the U-Notch chute on the southwest face of North Pal. We did this part of the route the previous time so navigation was straight forward. I relied on Hakan for route-finding since he had done extensive research on it. He told us about the LeConte Variation, the Clyde Variation, and the Moore Variation which he thought was the easiest route after reading several trip reports. The U-Notch chute was full of loose rock that could slide down the hill once you step on the wrong one, just as I remembered from the previous year. I carried the rope while Hakan carried the climbing gear in our backpacks, it was slow going. Vlad seemed to have regained most of his energy and he was able to use the single trekking pole to overcome his ankle problems. A bit over half way up the chute, Hakan pointed out ledges on the left side of the chute that he thought might be the branching point for the Moore Variation route. After one false start he was able to find the correct ledge system, marked by large cairns. We headed over to the ledge, put on our rock shoes, and stashed our poles and some water. Only Vlad kept his pole. I started heading up the ledge, climbing up class 4 terrain when progress forward seemed to be blocked. Hakan required a belay at one section. Then it seemed that there was no way to go. We were off route! I was a bit frustrated. Vlad found a class 5 route down that seemed to lead to the correct ledge. He just down-climbed it without protection. Hakan and I then set up a rappel there, and took turns to descend to that ledge. It was indeed the correct one. While I organized the rope the two of them went quickly ahead out of sight. The chute above the ledge system climbed up directly to the "bowl" below North Pal's summit. The climbing was mostly class 3 but a bit exposed in places. I made progress slowly because I had to find the easiest line to climb up by trial and error, since the other two were out of sight. Nearer the summit the winds picked up more, sapping my energy. The blocks supporting the summit of North Pal were incredibly huge, and often I had to make awkward moves to cross the gaps between these blocks. At one of the last blocks I made several attempts but just couldn't get it, while hearing Vlad and Hakan talking and enjoying the summit views. I had to drop my pack, push it over to the higher block, then I was able to mantle the move. Finally I made it to North Pal's summit! Vlad apparently had been there for 20 minutes. He had eaten an apple, probably the first food he had taken in over a day, and was watching a music video of Michael Jackson's "Billie Jean" on his IPod. Hakan was so excited, yelling into his camera as he recorded his summit video. North Pal dwarfs all the mountains surrounding it; its immediate vicinity also has the sharpest vertical relief, a veritable forest of jagged spires separated by gaping voids thousands of feet deep. In every direction smaller mountains in the hundreds marched in grand formations into the distant horizon. We could see our tents in Dusy Basin, just little colored specks in the vast rocky moonscape. I found the summit register, where Vlad had already written an entry for us. I added some words. It was a glorious, happy moment. This was the 3rd time Vlad and I ventured to Palisade Basin, trying to climb North Pal, and we finally made it. The summit was very windy, sapping the energy out of the three of us. Quickly, we retreated by rappelling off an existing anchor a few yards away. From there, down-climbing took us to the "Moore Variation" ledge system where we came up. Thinking that we might need a rappel, I searched around and found that the whole ledge system was class 3. This means via this route someone can climb North Palisade without a rope. Hakan was excited that it was within his climbing abilities after all. Once we descended to the junction with the U-Notch chute, I was relieved because it was still relatively early in the day, and the rest of the descent should be a piece of cake compared to what we had already done. We were probably going to reach our camp in daylight, that's very good prospects. Vlad hated the descent over all that endless talus, but otherwise we got back safely and in good time. Hakan had the smart idea to stash our rope and climbing gear at Thunderbolt Pass so that the two of us didn't have to carry the weight all the way back to camp now and back the next morning. We did exactly that before returning to camp from Thunderbolt Pass. Vlad was in good spirits now and he ate dinner before retiring to the tent. The day had gone better than I expected. Taking a break at Thunderbolt Pass. Last bit of climbing before the summit. View of Palisade Glacier and Mount Sill from the summit. Descending to the "Moore Variation" ledges. Scrambling huge boulders below Thunderbolt Pass during descent. Although my climbing mentor Dirk had recommended traversing to Starlight Peak from North Pal in the same day, it was not a realistic option for us. From reading the guidebooks it seemed that the traverse route between the two peaks was complicated and more difficult. Judging by the timing when we reached North Pal's summit, we did not have the extra 4 hours to do the traverse to Starlight and back, assuming we could climb the whole section without belaying (not a realistic assumption). Hakan's suggested route was the only alternative - the standard Northwest chute route to Starlight Peak. On the morning of 6th three of us started out together, Vlad continuing to use one of my trekking poles. The most efficient way to Thunderbolt Pass took about 1 hour 10 minutes, then to reach the Northwest chute we scrambled over very loose talus, although over less distance than the previous day. This route to Starlight Peak requires more complicated route-finding, including going into several chutes, so Hakan and I each kept a copy of the route description in our pockets. The first chute is much narrower and steeper than the U-Notch chute for North Pal; the ominous walls of broken, jagged granite surrounding us seemed ready to collapse at any time, a frightening thought. Hakan and I stashed our poles in the chute before the first technical section. We needed to climb up a class 3 section to the right, where Hakan needed a belay. Vlad lead the climb as always and I stayed behind Hakan to provide some safety. Then we were on easier terrain until reaching the top of the chute. Here we needed to traverse into another chute along a narrow, exposed catwalk. This new chute featured a deep abyss down below the traverse. Vlad lead this traverse with two pieces of protection, then Hakan followed, while I cleaned the pitch. We then gazed upon the "waterfall" in the route description, which was still flowing. Vlad and I started to climb to the right of the water fall, while Hakan argued for climbing it directly. Eventually we followed Vlad over a full pitch of exposed class 4 terrain. I got a belay as did Hakan here, but Vlad soloed everything. Fearing we were off-route, I looked out toward the top of the chute, and found an easy class 3 traverse back to the center of the chute. This was probably the standard way to get past the water fall. Vlad and Hakan forged ahead, climbing up and around a snowfield, then up an increasingly steep chute. It looked scary to me. After organizing the rope I followed them, gingerly handled each climbing move since it was quite exposed in places. There was another party rappelling off the summit of Starlight Peak, whom Vlad talked to while waiting for me. Hakan had to take care of a diarrhea problem. Later he told me he probably didn't boil or filter all the water he took from the stagnant tarn at our camp site. Once I made it to where they were we stashed some gear, then climbed up a steep class 4 section with belay for Hakan. Now at a gap in the ridge, with fierce winds blowing around us, we made quick work of the next ridge traverse section. Now we could see the "Milk Bottle" - summit spire of Starlight Peak, but there was a big gap between huge blocks that we had to cross. It was too big. There were 2-3 other parties hanging out below the "Milk Bottle", but on the other side of the gap. One of the parties were the people we ran into at Thunderbolt Pass the previous morning! They were going to do the Palisades Traverse, but their progress was apparently much slower than planned (this was only the second peak in the 5-peak traverse). We asked for an alternative way to get to where they were, and he told us there was a class 3 way on ledges below. Hakan and I proceeded according to the directions, while Vlad simply crossed the big gap (he's taller anyhow). Then, before we actually reached the base of the spire, Vlad was already climbing the "Milk Bottle" without a belay! This was incredible, he was wearing approach boots and carried a trekking pole in his hand! He asked for the rope, which I told him was in my backpack. He got the backpack from me so that he could thread the rope through the existing anchor on the top of the "Milk Bottle". While he climbed it solo, knowing he could die if he fell, the other guys and gals looked on from the base of the summit with incredulousness. Finally he surmounted the "Milk Bottle", stood up on the tiny summit, and outstretched his arms in victory! How amazing, but I knew he had that in him all along. Vlad threaded our rope through the anchor so that the rest of us could climb up using a top rope protection. We also agreed to help the next party thread their rope through it. Apparently the young climbers in the other parties were stumped by this spectacular, exposed spire, and no one had tried to climb it due the lack of protection options for the first climber. After Vlad set up the top rope for Hakan and I, Hakan was next but was not sure how to go about climbing the summit. He let me go first, so I started climbing the smooth piece of granite spire, belayed by a guy from the other party. I figured out the right moves after a few trials, and soon I was on top of the thin spire. It took me a minute or so to slowly stand up and raise my arms, not wanting to upset my balance the least bit. At class 5.4 this wasn't quite as difficult as the 5.9 summit block of Thunderbolt Peak (which I climbed using a rope ladder instead of doing a free climb). However, with all that frightening exposure I was proud of myself for having climbed the "Milk Bottle" as a free climb. It was an exciting moment, looked on by Hakan and Vlad taking videos/photos and the other parties in amazement. Hakan climbed the "Milk Bottle" next. He also helped set up the top rope for the next party, after enjoying the wonderful exposure at the top of the world by taking snap shots in every direction. We were in a euphoric mood. After rappelling down from the summit, we took a few hero shots of each other, signed the summit register, and headed down soon after. It was close to 4 pm, we estimated that we would be reaching camp at around 10 pm. This gave us a sense of urgency to complete the difficult down-climbs before sundown. We did a number of rappels, the first one from near the summit and it was an overhanging rappel. Not too bad, then we found several more rappel anchors, which we took advantage of as much as we could to save time. Vlad always rappelled first, and tried to extend the rappel as long as possible to make use of the full length of the rope. We belayed the exposed traverse again, while doing that the orange glows of sunset washed over us and painted the granite rocks in a golden hue. We hurry up, down climbed to the location where the last rappel should be, then argued over where to set up the rappel. It seems that when we got tired we argued more, this also happened in the previous trip over rappels. I arrived last and spotted a shiny piece of metal in the jumbled loose rocks, which settled our arguments. Vlad extended the last rappel to the very end of the rope, making use of the entire 100 feet (when doubled up). As this time it was getting pretty dark and we needed to turn on headlamps. Fortunately we were steps from getting out of the chute and it's all relatively easy from here. Three of us agreed to stay together in the dark since the route-finding to the camp site was challenging and we could easily get lost if separated. Vlad's headlamp didn't have sufficient charge, so I walked close to him to shed some light over the treacherous loose talus. I really wanted to make sure he didn't injure his ankle any further. It was slow going, while Hakan stayed ahead to find the best route back to camp. Once below Thunderbolt Pass there was a maze of easy slabs and meadows which were difficult to navigate in the dark. When we walked on the first meadow, I felt relieved because this meant we were on the right track and it would only get easier after this. Hakan lead the way and we arrived at the camp around 10:30 pm, exhausted but all safe and without more injuries. This was a very challenging but also exciting and proud day for me. Jagged, foreboding walls of granite. View down to Palisade Basin from near the summit ridge. Reaching the summit ridge at the notch between North Pal and Starlight. On the summit ridge traverse. Vlad on top of the summit of Starlight Peak ("Milk Bottle"). Hakan on top of the summit of Starlight Peak ("Milk Bottle"). Looking down from the "Milk Bottle". View of North Palisade from Starlight Peak. Me rappelling from the summit. Vlad rappelling down Starlight chute. We packed our camp and hiked out on a glorious clear day with perfect weather. What a difference from our approach hike! Before we left camp, we found many tadpoles swimming in the stagnant tarn we used as our source of water. The many serene alpine lakes in the Bishop Creek basin were so beautiful, prompting Vlad to consider having a swim in Long Lake. I loved the idea; having swum in the previous two climbing trips this year, I'm more used to cold water than before. Vlad took a few dives and quite a long swim in the lake, while I only dove following Vlad's example. The temperature was probably in the low 50's Fahrenheit, cold enough that I swam to shore right after getting into the lake. The two of us persuaded Hakan to also take a dip, he was brave and we had a video clip to prove it! Having climbed these two difficult peaks has changed my perception of what I'm capable of, it's an empowering feeling. This was a fitting finish to a summer of successful climbing trips in the Sierra Nevada. See Hakan's beautifully annotated trip report slide show with maps of our climbing routes. Hiking out from Dusy Basin. Meeting a pack train at Bishop Pass. Vlad swimming in Long Lake.